Posted on March 23, 2018 at 12:00 pm. Do you know what the BCC mission statement is? We all have the same goal, but achieve it differently. How are you working to fulfill this mission statement? What is your greatest strength in one word? How do you display said strength while working? What is you Negative strength in one word? How do you display your negative strength into a positive strength? If you were to be recognized, in your opinion, what would you be recognized for? Posted on March 16, 2018 at 4:32 pm. How long have you been for working at the Board of Child Care? I was an Intern for 1 year, Child Care Worker for 1 year, and now I am a social worker for almost 7 months. Favorite memory while at the Board of Child Care? We all have the same goal but achieve it differently. How are you working to fulfill this mission statement? Collaborating with all parties of treatment to ensure that all need are met and making sure that youth have the opportunity to display improvement. Can you help us understand why you chose to include the image below? The single most memorable day of my life was spent with Rebecca, Trina and Chloe. 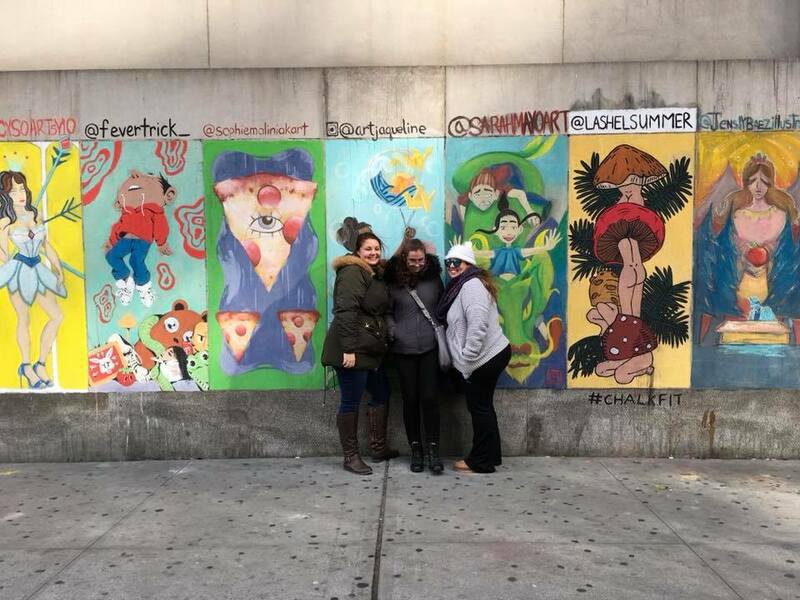 It was my first time in NYC and I will be forever grateful for our fearless leader and chaperone. To read more about my fabulous trip to NYC click here! Posted on March 16, 2018 at 3:47 pm. How long have you been for working BCC? In June 2018, it will be 7 years. 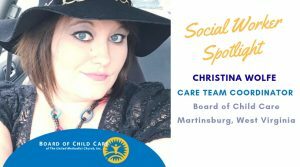 Favorite memory while working for the Board of Child Care? My role is to support all of the talent in the upper campus program. A huge part of my support is to ensure that the staff work with the mindset of helping both the youth and their families with their needs. “We are not only here for the youth while they are in care but, we are here to forge a path in which they will succeed in the future,” says Glover. “Our job is not done if they can only do better here.” I also like to have direct relationships with families so they know they have someone they can go to as a resource. Posted on October 19, 2016 at 10:57 am. Hunt is a born and raised Washington, D.C. native with a passion for working with young children. She received her associate’s degree in child development from Southeastern University. 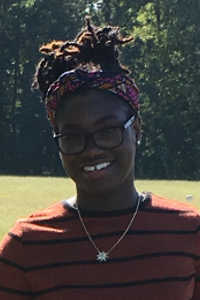 Hunt became a teacher in 2006 at BCC’s Early Learning Program (Washington, D.C.). Q. Have you always known you wanted to work with young children? A. Absolutely. In high school, I was a tutor in an aftercare program, and from them on always had a passion to work with young children. When I graduated from Southeastern, I went to work at a childcare center right away. Four years later, I joined BCC and have been here ever since. Q. DC uses a mixed income model in its classrooms. How does that work? A. A little over half of the children at the DC ELP are utilizing a voucher from the District of Columbia to cover tuition. The remainder of the families pay privately. I really like this model because it encourages an exchange of culture. Traditions such as clothing, language, and observed holidays all shine through in the classroom. It is a special moment when you see that the kids are learning from each other. Q. You mentioned you had a “shadow” with you from day one. Who was following you around? A. My first day at BCC was also the first day for an adorable little one-year-old toddler. I just so happened to be the first person she met when she came to the center. She must have seen my “I’m new here too” glow because she followed me around all the time after that! Q. Leaving their parents is tough for some children. What do you do to help them adjust? A. You absolutely need to be compassionate and remember that every child will adjust differently. The DC program serves kids from six weeks up through five year olds, but all of them need a lot of nurturing at this stage in their lives. Q. 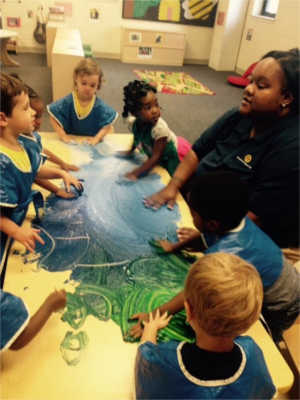 How have early learning programs changed since you graduated from school? A. I think the whole industry of childcare is changing and I am glad to be at a place where an actual curriculum is used. [Ed. Note: the curriculum the DC ELP uses is called the Creative Curriculum]. I learn a lot from it. I like all the ideas it gives me for how to manage my classroom and the actual resource cards, books, and learning tools are great. I also recently attended Quality Improvement Network’s (QIN) almost yearlong training in early childhood development and really took a lot away from that. Q. We heard you took away more than a certificate of completion after the QIN training. What was it? A. I was honored to be selected by my fellow classmates as the winner of the “QIN Spirit” award! Posted on September 26, 2016 at 9:36 am. Ayers started at BCC in 2014 as a Child Care Worker on the Denton Campus covered in beef stew (Not a typo! read on for the full story). In October 2015, she was selected to manage a community-based program BCC received a grant to start. Ayers graduated in 2004 with a B.S. from the University of Maryland Eastern Shore in human ecology (child development concentration). A Dover, DE native, Ayres has spent her career to date focused on helping young adolescents. You’re at a BBQ and somebody asks you what you do. How do you describe your role? The kids and the families you work with? I start with the basics and just tell them I work at a group home in the community. I admit I do get a few funny looks. I think that comes from the stereotype that some people have of who lives at a group home. Or they think that because I’m a girl that I shouldn’t be working with adolescents with behavior challenges! But I just tell them the kids are awesome and that it’s your relationship with them that matters more. Not how big or strong you are. Who have been mentors for you as you’ve started your career? I would definitely say Karen has been a role model (Ed. Note: Karen McGee, Denton’s Program Director). I can ask her anything and I learn something from her every time. My older sister is another – she’s like my second mom. She kind of raised me because my mom worked an overnight job. Do you get a lot of support from your family for what you do? At first I don’t think they really understood why I wanted to do this. Even though my sister is older we’ve actually been living very parallel education and work lives. We graduated from our respective colleges a week apart. My sister is working at a group home in Delaware as a parent aid and my cousin actually just started a job in the human services field. So now it’s becoming more of a family thing and I think everyone understands a little better who we’re actually helping and how much of an impact we are making. So the “stew” story we gather is kind of famous on campus. Could you share what happened on your first day? My first day at BCC is definitely a story shared often around here. I was sitting with two boys at lunch and they started to argue about something. One of them accidentally spilled his bowl of beef stew all over me. I finished my shift and believe me each day since I have kept a spare set of clothes in my car! I guess some people would have said this job wasn’t for them after something like that, but I knew after that first day I was supposed to be here. You’ve switched roles from Child Care Worker to working on this Community Program grant. Tell us about that. About a year ago BCC was awarded a grant from Caroline county to do more therapy with young adults who were exhibiting “at risk” behaviors. The work was really focused on early intervention and trying to keep them out of the foster care or juvenile court system. This year Caroline county shifted the focus of our work to target youth who have at least one parent recently released from incarceration. I do a lot of work on just basic communication. When a young person hasn’t had this adult figure in their life for some time it can be difficult to reconnect (and vice versa for the adult – they feel awkward and don’t know what to talk about). I’m excited because this work is all about strengthening families and the stronger we can make them, the stronger the community will be overall. What’s next for you? Going back to school? My next life adventure is definitely graduate school. I’m going to try to do my degree online because I really like this job and don’t want to leave! If you could snap your fingers and something could be different, what would it be? Probably extend the day. There just isn’t enough time to do everything I want to! Posted on June 28, 2016 at 3:10 pm. 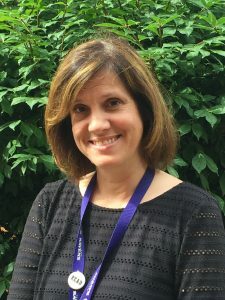 Lynette Seay (pronounced ‘see’) has taught reading and writing at Strawbridge School for the past six years. A native of Brooklyn, NY – Seay graduated from Notre Dame of Maryland (undergrad) and Loyola University (master’s degree). She previously worked at Children’s Guild, Kennedy Krieger, Baltimore City’s Lyndhurst Elementary school and was a stay-at-home mom before jumping back into her teaching career. Seay lives in Overlea, MD, with her husband and three children. Q: Unlike public schools, where tenure most often applies, six years is a good stretch of time at a non-public school. What keeps the fire burning for you at Strawbridge? A: When you are new to any school, it can be daunting not knowing the kids or staff. As I got to know the students and staff, I saw that the school is the best, most therapeutic place for them. Seeing the achievements of our students and building relationships with my coworkers has made the transition to the non-public arena worth it. In addition, the energy around the school, the campus setting, and the organization itself under Laurie Anne Spagnola’s leadership make a big difference. While you do sometimes hear teachers talking about not being invigorated or valued within the education industry as a whole, I feel quite the opposite about teaching at Strawbridge. Q: You said the school invigorates you. What makes Strawbridge different from other schools in public and non-public sectors? A: We utilize a team concept to every student’s education within our population so we have many different, qualified individuals to lean on. No one teacher carries the entire load. Because we have been in the trenches with each other, we know strengths of every teacher and student. That is the main reason the school has such an outstanding graduation rate as well as a high retention rate for students and staff. We have kids who travel almost two hours one-way to attend school here – we must be doing something right! Q: Your role is changing next year – what has you excited about this new position? Does this change your goals as a teacher and for the school? A: I am joining the staff development team. I will still be in the classrooms, but with a focus of training the teachers more so than the kids. What excites me about this role is I get to support my peers and ensure consistency within the programs. The school’s Director of Professional Development and Curriculum, and I share this excitement about building the school up, building the resources up, and getting the school to be a more dynamic place to learn and teach. Raising reading and comprehension levels is always a challenge, but over the last six years, the school has been compiling data focused on these outcomes. This summer we’re taking this collection a step further and plotting our metrics against those of the research-based curriculums we purchased. This is definitely an exciting direction and a project that excites me as an educator. Q: Reading and writing sound like a basic skill, but you see it as so much more. Can you expand on why this is such an important aspect of teaching to you? A: Texting and social media have really put some challenges in front of teaching reading and composition. Common Core standards say we are supposed to deliver a student who can communicate effectively with the written word. Being able to apply for a job, respond to professional communications, and have a chance to succeed in adulthood does matter. However, it is more than learning a useful skill. For the student population, we serve, reading and writing is joyful. It is a coping skill. It is a way to identify with different aspects of themselves as they seek out who they are and what they want to be. I have a student dealing with some serious transgender issues, and he is asking for books that might adequately reflect who he is and who he is trying to be. These are real issues; to have the ability to read and write – and use reading and writing as an outlet to express their feelings – is important and therapeutic. Q: You have some serious sports diversity – and intense rivalries – in your family. That must make Thanksgiving interesting! Tell us about that. A: I grew up in New York City – my mother once met the Brooklyn Dodgers’ Jackie Robinson in the subway – but because I went to school in Maryland and raised my family in Maryland I’ve really become more of a Ravens fan than I ever was a Giants fan. Just to make the rivalry even worse my son has become a fan of the Patriots! However, in the spring it becomes harmonic in our home because we are all big fans of the Orioles. My New York family does not understand how this happened, but I cannot help it – the Ravens are so scrappy! It seems people either love or hate the Ravens…and I love them! Do you know of someone worth spotlighting at BCC? Email that recommendation to communications@boardofchildcare.org. Posted on May 25, 2016 at 8:40 pm. 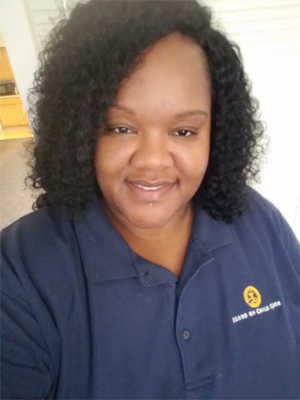 Glover earned an April promotion to Care Team Coordinator, where she will assist with integration and implementation of programming on Baltimore’s upper campus. Known at BCC as Alex, she’s a 2009 graduate of the University of Kentucky — Go Cats! 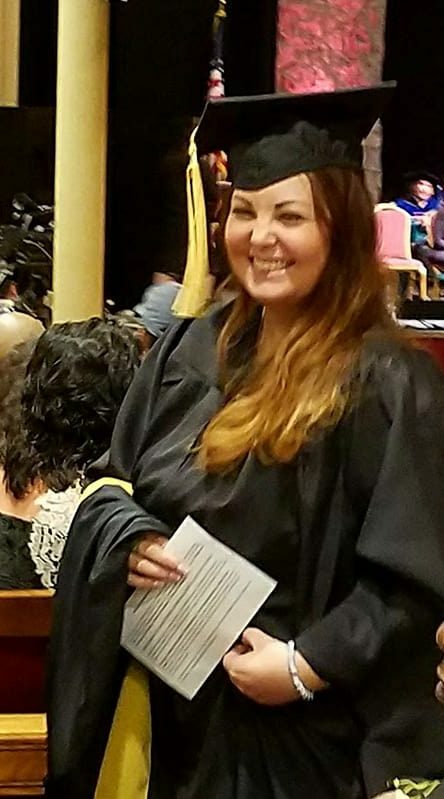 — and secured her master’s degree in Social Work from the University of Maryland in 2014. 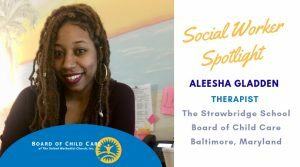 Q: Before you became a social worker, you were an on-call childcare worker and later interned with our Treatment Foster Care team while you attended graduate school. What was your perspective those first few months – how has it changed? – and how did those challenges prepare you for your present caseload and responsibilities? A: I went from a person focused solely on doing one job to dispersing my energy into many areas at once. The challenge was to find the balance in juggling work, school, and the internship while ensuring the multitasking would not affect my work and relationships built with my youth. I had many ‘aha moments’ in those first few months of grad school and still have them. It is all part of being a social worker … You need some grit in this field, because it’s not for everyone, but it is for me. Those challenges and experiences have aided me many times when I had a demanding week and was not sure where to start. Prioritizing tasks and figuring out what is important is how you win the day. Q: Your second graduate school internship was with Johns Hopkins Hospital, but you choose a full-time offer from BCC over Hopkins after graduation. What made BCC your top pick? A: I was fortunate to have to decide between BCC and Hopkins, but the decision was not difficult. I had fallen in love with residential treatment and felt like BCC was already my home. I like being in a setting where social work and mental health were the top priorities, whereas in the hospital medical needs were understandably put first. 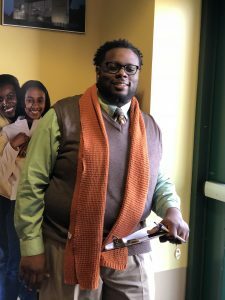 I also wanted to work in a position where I could build long-term therapeutic and working relationships with clients, families, and agencies. Q: Can you talk about how your progression from childcare worker four years ago to intern to social worker to coordinator helps shape the therapeutic strategies you employ in your new position? A: We speak of our participants from a programming or clinical standpoint, and I am blessed with some background in both, so my progression shapes strategies daily. Residential care is constantly evolving; the challenges I faced as a childcare worker are different today, but I know both perspectives. I am excited about my new position because it is completely in line with BCC’s new mission. This is a way to bridge BCC’s work from a clinical and programming standpoint from a time where we were separate to being truly integrated. Q: You said the diverse team that supports the kids we serve is vitally important to achieving successful outcomes. What makes this so? A: We are tasked with designing and executing a program that completely wraps care around an individual. This means the more obvious categories like education, physical health, and providing housing. It also includes the intangibles such as teaching life skills, coaching them how to be their own advocates in treatment meetings, and just generally supporting them through breakups, crushes, tough teachers, and everything else that comes with being a teenager. That is the best way I can describe how BCC becomes their nonconventional family. Each member of the care team is working on one, if not multiple goals in those categories I just mentioned. We must all learn from one another, and from the youth directly, what is working and what isn’t. That’s where the communication piece is so critical and having a diverse team so important. One person may think to try something a different way and that becomes the breakthrough moment that really resonates with youth. Q: Kentucky and Maryland are two universities with proud basketball heritages, and your brothers attended the University of North Carolina. March Madness must be intense, right? A: Yes, quite intense! We grew up watching and rooting for Maryland – and still do! – but our primary loyalties are with Kentucky and UNC now. I decided I’d take it easy on my parents and made them a blanket they keep on the couch with one side UNC and one side Kentucky. My mom just flips it over dependent on the game they are watching at the time. I also gave them two attractive yard gnomes as a present one year that they now proudly keep in our nice living room. We rub their heads for good luck on big game days! All serious fans have their rituals, right? Needless to say, it’s not bad being a basketball fan as a member of our family – most years we’re going to have at least one serious contender! Know of someone worth spotlighting at BCC? Email that recommendation to communications@boardofchildcare.org. Posted on March 31, 2016 at 11:00 am. 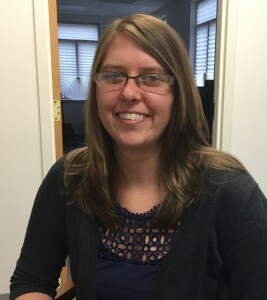 Sarah Dischner, 29, is a Clinical Social Worker based out of BCC’s Charlotte Hall office in southern Maryland. 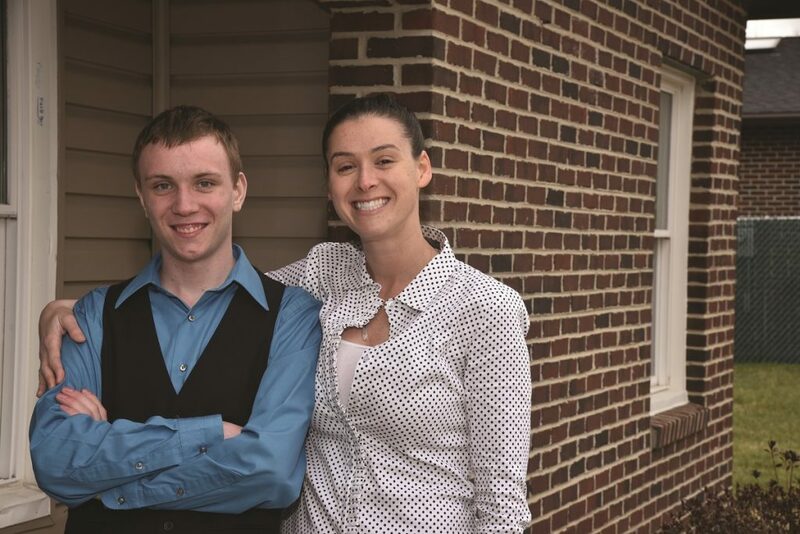 Exclusively seeing youth in BCC’s Treatment Foster Care (TFC) program, Dischner came to BCC in 2015 after seeing schizophrenia patients in Pittsburgh the prior four years. 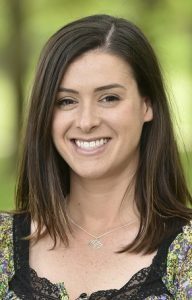 A native of Williamsport, PA, Dischner earned a master’s degree in social work from the University of Pittsburgh in 2011. A: I was planning to move to the Maryland area in general and the opportunity with Board of Child Care sounded interesting because working with children was always appealing to me. Q: What is your title and what does a garden-variety day look like for you? A: As a clinical social worker for TFC I serve youth and families impacted by complex trauma. A typical morning for me includes compiling notes, prepping for appointments, and completing care plans and other paperwork. I start seeing youth when school is out, so I spend afternoons on the road and in the community. I conduct one on one visits with the kids, as well as sessions with them and their families. Sometimes this means their biological parents, and sometimes it is with BCC’s TFC parents. I work closely with the TFC team to make sure that both the child and the TFC parents are receiving the support they need. Q: This is not a typical 9-to-5 job – what makes this work rewarding to you? A: Being able to help someone make the small changes in their life that translate to big changes for them and their community is what gets me out of bed in the morning. The youth and families I work with volunteer to participate in therapy with me – and sometimes not everyone wants to be there. Many little engagements are necessary to earn the respect and trust of the child and their family (biological or foster care) to make progress possible. Q: What has been better than advertised about coming aboard with BCC? A: Being able to flex my schedule has been a big benefit to working at BCC. If I see someone at eight or nine in the evening, I can come in at 10am the next day so I do not burn out. I have also been impressed with the organization’s effort to make sure practitioners get the help and attention we need. I feel like supervisors actually care about the staff and having that support has solidified for me the feeling that I made a good decision to join BCC. Q: You recently found a horse tooth from the Ice Age. What is this all about? A: Shark teeth, crab fossils, and mollusks all wash up on the shore of the Chesapeake Bay. Calvert Cliff State Park and Flag Pond State Park are two of my favorite beaches to visit. Winter is definitely better than summer for this activity. A few months ago, I found a tooth much bigger than normal for a mammal. After I posted a picture online, Calvert Marine Museum contacted me and indicated it was probably from a horse and that they would like to see it and study it further. Mammal teeth are rare because typically, during the Ice Age, mammals would die, float out to sea, decompose, and sink – so finding the tooth on a beach is unusual and very lucky! The version of this article published in Keywords originally listed Sarah’s title incorrectly as an Integrated Dual Disorder Treatment (IDDT) specialist. She is a Clinical Social Worker at BCC. Our apologies to Sarah!